This article is about the type of apparel. For the magic effect, see Armor (effect). For the spells, see Armor (spells). Armor is a type of apparel that is worn on the body to reduce damage from attacks. Armor comes in two varieties, corresponding to the two different skills governing armor usage: Heavy Armor and Light Armor. In addition, there are shields which provide an additional passive increase to armor rating (active blocking is governed by the Block skill). The Divine Crusader Creation adds an additional type of armor: the Fastened Shield of the Crusader, which is a Shoulder piece. In addition to standard pieces of armor, two necklaces in the game provide an armor bonus: the Locket of Saint JiubDG, and the Amulet of Articulation. Armor appears in several different materials and styles, which determine the quality of the armor. 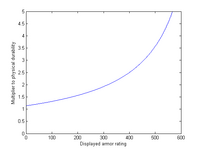 Higher quality armor provides better protection (but is generally heavier). Which quality armor you will find is generally determined based on your character's level. The following tables describe the base level at which an armor type begins to show up randomly for the player. Lower level armor will also randomly appear, but so will higher level armors in certain situations: potentially up to at least 12 levels "early". Enchanted versions of each armor type will begin to appear one level later; see Generic Magic Apparel for more information. See Leveled Lists for details on how these lists are used to determine the probabilities of individual items appearing. Although Dragonscale, Dragonplate, and Daedric armors can all be found in random loot, once your level is high enough, the chances of finding any of these armor types is 20 times less than finding other armor types. Most armor from the list below can be created at Forges, by using the Smithing skill. The ability to make armor is not dependent upon your character's level, but is instead dependent upon which Smithing perks you have unlocked. All standard armor can also be tempered at Workbenches, if you have the necessary auxiliary item. Tempering is twice as effective if you have unlocked the perk necessary to forge that armor. Tempering an enchanted version of the armor (whether custom-enchanted, or generic) is similar to tempering the base version - it requires the same auxiliary item, and is twice as effective if you have unlocked the forging perk - but also requires the Arcane Blacksmith perk to be unlocked. Jewelry (specifically, amulets/necklaces and rings), can be created at any blacksmith's forge from ingots and jewels, but these are not counted as protective armor (the two exceptions to this are noted in the section above); similarly, circlets/crowns - like common clothing - have no armor/protection value and cannot be crafted. The Aetherial Crown, which is a unique, quest-related, crafted item (added by the Dawnguard add-on), unlike other jewelry items, is eligible for improvement by ordinary smithing, but still only ever bears an armor rating of 0. The Dragonborn add-on adds craftable Bonemold (heavy), Chitin (light/heavy), Nordic Carved (heavy), and Stalhrim (light/heavy) armors. The Dawnguard add-on adds Dawnguard armors (light/heavy) and Vampire armors (light), which may be worn/improved but cannot be forged by the player. ^Improved Bonemold equipment must be made - it will not be randomly found. ^^Studded armor only comes in a cuirass, so there is no studded suit - the values listed here pair it with a hide suit. ^^^Vampire armor has no helmet. †Dragonplate Cuirasses and Shields are tempered using Dragon Bone; all other Dragonplate armor is improved using Dragon Scales. ††Forging Stalhrim armor also requires completion of the quest A New Source of Stalhrim. ‡All Daedric armor (except the boots, which are bugged) can also be made at the Atronach Forge, in which case the Daedric Smithing perk is not needed, but instead the Sigil Stone must be obtained. Tempering armor created at the Atronach Forge is still augmented by the Daedric Smithing perk. ‡‡ Version 1.2.7 of the Unofficial Skyrim Patch moves the Ancient Nord armor to the "Steel" category, and makes it require Steel Smithing to forge. For all of the armor listed on this site, the provided armor ratings are the base armor ratings. The actual protection your character will receive from the armor is dependent upon your skill in that armor type and any relevant perks that you have unlocked. The rating can also be improved by using smithing to change the armor's quality to "Fine", "Superior", "Exquisite", "Flawless", "Epic", or "Legendary". The armor rating only reduces physical damage, not magical damage. Each point of armor rating reduces damage by 0.12%. Clothing and robes do not benefit from the hidden armor rating bonus. For NPCs the skill coefficient is 1.5 instead of 0.4. Note the difference between skill effects (e.g. Fortify Light/Heavy Armor equipment, Ancient Knowledge) and armor effects (e.g. Oakflesh, The Lord Stone). Your durability against physical attacks (i.e. the amount of raw damage you can sustain) is proportional to 100/(100 − damage reduction percentage). This results in hyperbolic growth in your physical durability, up to the cap of 80% damage reduction giving a ×5 multiplier to your physical durability. Thus, the more armor rating you have, the more each additional point of armor rating is worth. The graph displayed shows the multiplier to your physical durability relative to no armor based on the displayed armor rating, assuming you are wearing all four pieces of armor (+12% hidden damage reduction) and have no other effects. Without a shield your armor must provide a base armor rating of about 130 (567 / (1.4 * 1.25 * 1.25 * 2)) to reach the armor cap. Heavy Armor: The best heavy armor, Daedric armor has 108 base armor rating → 481 displayed armor rating → 69.8% damage reduction. With a shield, you must reach a displayed armor rating of 542 to reach the armor cap. While it's impossible for a light armor user to reach the cap relying only on Light Armor skill and perks, you can still reach the cap without using Smithing, Enchanting, or Alchemy effects. A player with maxed out Light Armor skills, a full set of Dragonscale armor, and a Dragonscale shield will have a displayed armor rating of 423 and a 65.66% damage reduction, 119 less than the 542 displayed armor rating needed to reach the armor cap. Activating the Lord Stone will boost displayed armor rating to 473 and a 71.66% damage reduction. Casting the armor spells Ironflesh or Ebonyflesh will boost displayed armor rating over 542, reaching the 80% armor cap. Reaching the armor cap becomes significantly easier with smithing. Let's say you have 100 smithing and all relevant smithing perks in addition to 100 armor skill and all relevant armor perks. Improving a piece of armor to Legendary quality adds +10 to the armor rating, or +20 if the piece is chest armor. This means that improving a fully matched armor set to legendary boosts the total base armor rating by 20 + 10 + 10 + 10 = 50. Without a shield your armor must provide a base armor rating of about 80 to reach the armor cap, since 80 + 50 = 130 (567 / (1.4 * 1.25 * 1.25 * 2)). Light armor: A full set of tempered Elven Armor with a matching shield yields a displayed armor rating of 550, enough to reach the armor cap. This means that any matching set of light armor equal or higher in quality to elven armor can be used to reach the armor cap. With Fortify Smithing enchanted apparel and Fortify Smithing potions you can boost Smithing even further, which can potentially allow any material to reach the cap, without needing any further benefits (such as the Notched Pickaxe); with maxed out enchanting and alchemy and the appropriate perks, using fortify enchanting potions to make better fortify alchemy apparel to make better fortify enchanting potions, to provide the best available Smithing bonuses, you will add 134 total tempering to any suit even without a perk, which is above the 130 rating mentioned above. This means you could temper a theoretical 0-rating suit (which doesn't exist) high enough to hit the cap, and you don't need a shield to get there. With a tempering perk, you will nearly double this, adding 259 to any suit you make; this is practically sufficient to drop any non-chest piece from any suit, and even with the loss of two armor perks (for wearing a full suit and wearing a matched set), you will still hit the cap, allowing you to walk around without a helmet, if you like - just remember, you will also lose any other armor perks you have that trigger off of having a piece in all 4 wearable slots. Clothes such as robes and other apparel do not count as armor, and as such do not benefit from the hidden armor rating bonus. Custom Fit, Well Fitted, and Matching Set perks are applied to shields if the four pieces of worn armor (armor, helmet, gloves, boots) match appropriately. The shield does not have to be of the same set, or even the same type (light or heavy). Shields do not benefit from either Agile Defender or Juggernaut, and do not advance the light or heavy armor skills when struck. Armor rating/damage reduction does not affect the speed at which the skill is trained. If you drop a piece of armor or clothing in front of an NPC, generally in a city or town, they may run up to you and ask you if you are throwing it away. Guards may comment on what kind of armor you're wearing, depending on what faction they belong to and what you're wearing at the time. † Scaled Horn Armor cannot be tempered or forged, because it was completely left out of the appropriate list. This bug is fixed by version 1.2.6 of the Unofficial Skyrim Patch. ‡ Fur Boots and Fur Gauntlets count as Stormcloak/guard equipment, and therefore do not give the Matching Set bonus if worn with other fur equipment. These images show a male Nord in different types of light armor. These images show a female Imperial in different types of light armor. These images show a male Nord in different types of heavy armor. These images show a female Imperial in different types of heavy armor. This page was last modified on 11 November 2018, at 20:34.